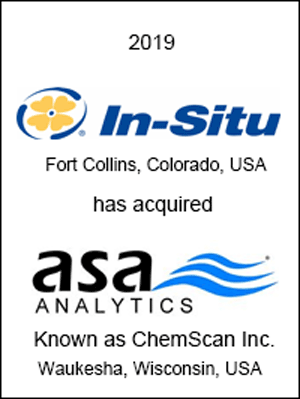 In-Situ Inc. has acquired ChemScan Inc., formerly known as ASA Analytics. The acquisition will expand In-Situ’s ability to serve process applications including municipal and industrial wastewater, drinking water, and other industrial water process markets. Located in Waukesha, WI, ChemScan specializes in the manufacture of automatic chemical analysis systems for water and wastewater monitoring and control. ChemScan analyzers use technology originally developed under contract with NASA to detect ammonia, nitrate, nitrite, phosphate and other parameters in water and wastewater using UV light absorbance for analysis. In business since 1994, the company provides operators and control systems with timely process chemistry measurements that facilitate increased plant capability, efficient energy and chemical usage, and compliance. In-Situ has been a leader in the design and manufacture of superior water level and water quality monitoring equipment. With the introduction of the Aqua TROLL 600 and Aqua TROLL 500 multiparameter sondes, the purchase of the Australian flow-meter manufacturer MACE, and now, the acquisition of ChemScan, In-Situ is now positioned to become a major competitor in the municipal water, wastewater and industrial process market. 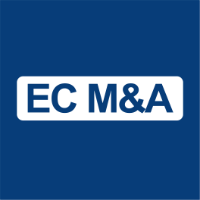 EC M&A acted as financial advisor to In-Situ on this transaction.